A newfound freeness in Tiger's swing has helped power his comeback. It was a long road back to the winner's circle, one that even Tiger Woods himself had worried would never come. But it did. The 14-time major champ captured his first victory in more than five years at the Tour Championship on Sunday, and was uncharacteristically emotional while describing his journey back. But perhaps the most impressive element of Tiger's 80th victory wasn't that he did it at all — given his play in recent months, a win looked to be coming. It was how he did it. Nowhere to be seen were Woods's usual directional struggles with the driver; he was a machine from tee-to-green all week. To help understand how Tiger got his swing clicking so well this week, we picked the brains of two of the brightest minds in golf instruction: GOLF Top 100 Teachers Mitchell Spearman and Mark Blackburn, who each explained what went right for Tiger at the Tour Championship. MitchellSpearman.com Spearman, who has first-hand experience talking with Tiger as an instruction at Isleworth Golf & C.C and Albany, The Bahamas, was particularly impressed with the ease with which Tiger swung the club last week. "For a while there there was so much discomfort in his swing," Spearman said. "Now, he's allowing his body to move a little more off the ball, there looks like there’s some freedom of movement." That freedom in Tiger's swing is rooted in a deeper knowledge of how his own swing and body works, Spearman says. He's embracing his natural tendency to make a fuller turn on the backswing, and therefore allowing his upper body to drift off the ball. 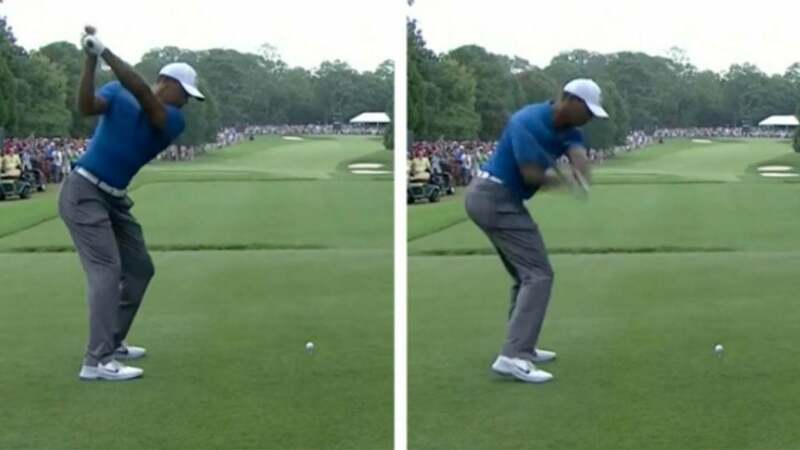 It's a move that allows Tiger to use his body to create leverage and trust his hands to square the clubhead at impact. "He trusts his swing through his hands," Spearman says. "I love that tiger’s not dependent on a golf teacher. He trusts himself and depends on himself because he knows his swing better than he used to. For a while there was too much of teachers' style embedded in his swing. What you see now is Tiger Woods." Tiger has done what many of us thought he would never do again. So, what’s next? BlackburnGolf.com A freer turn off the ball on the backswing can create problems on the downswing for Tiger when he's not acutely synched-up, though. He'll attempt to shallow the club too late on his downswing and the clubface will never return to square, leading to blocks. It's why he came into the event ranked a lowly 135th in Driving Accuracy. But Tiger avoided those accuracy issues this week for two key reasons, says Mark Blackburn, director of instruction at Greystone Country Club in Birmingham, Ala. "Tigers excels at separating his lower body from his upper body in transition....When he struggles he tends to get overly aggressive and fast in the transition, which creates a chain reaction of events," Blackburn says. "His rhythm and tempo was fantastic all week." https://twitter.com/PGATOUR/status/1043980339402567680 A smooth tempo allows Tiger to match up all the moving parts of his swing: a wide backswing; the separation of his upper and lower bodies; and his powerful drive down through the ball on the downswing. Tempo, along with an added focus on hitting more left-to-right fades at East Late ultimately proved the killer combo, Blackburn says. "Tiger drove the ball fantastically well and I saw lots of straight drives and fades, which I believe match well for Tiger," he said. What you can learn from Tiger: Sometimes, it's the simplest things that can make the biggest difference. A big, free turn on the backswing and a smooth tempo without rushing the downswing was the key for Woods at East Lake. It could be yours, too.